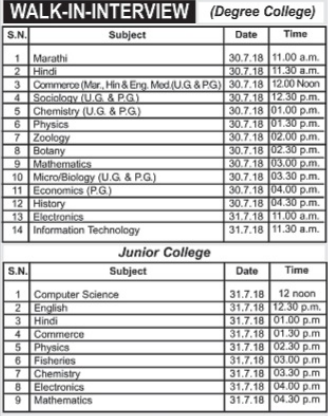 Seth Kesarimal Porwal College of Arts Science & Commerce, Kamptee has advertised in the THE HITAVADA newspaper for recruitment of Teaching Faculty- Lecturers jobs vacancies. Interested and eligible job aspirants are requested to walk-in on 30th and 31st July 2018. Check out further more details below. About College: In the year 1965, Seth Nemkumarji Porwal an industrialist started a college in the name of his father late Seth Kesarimal Porwal in Kamptee town. The college started running under the auspices of Shikshan Prasarak Mandal, Kamptee chaired by Seth Nemkumarji Porwal. In the year 1970, the college was shifted to the present site with courses in Arts & Commerce faculties. In the year 1971, the Science faculty was also started. 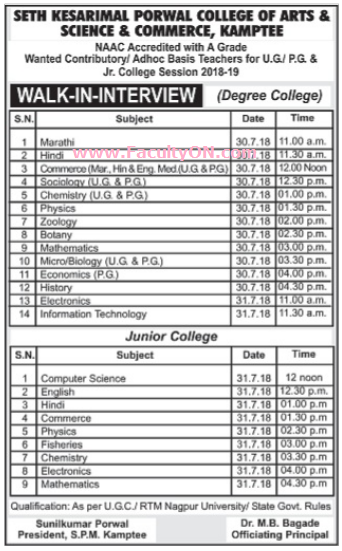 Seth Kesarimal Porwal College, Kamptee affiliated to R.T.M. Nagpur University Nagpur since 1965 is a premier institution of higher learning in Central India. It is the first college affiliated to Nagpur University to start UG & PG Courses in Information Technology. How to Apply: Interested and eligible candidates are requested to attend the Walk-in interview along with CV, originals & set of copies of certificates, PAN card, Aadhaar card and recent passport size photos to the walk-in address given below.